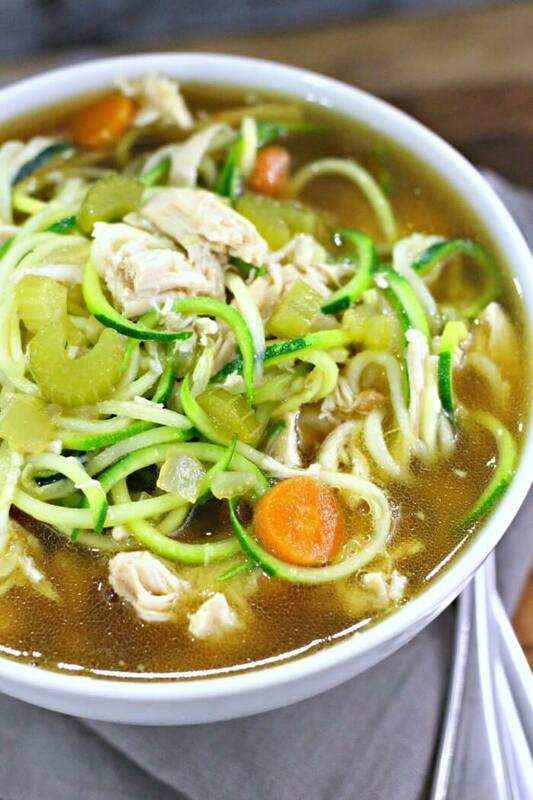 Chicken Zoodle Soup is the guilt free comfort food you didn’t know you needed. Easy to make, filling and delicious! Our chicken zoodle soup was inspired by a recent cruise we took to Alaska with Princess Cruises. Inevitably, if you travel as much as we do, you’re going to have a moment where you’re not feeling a 100%. 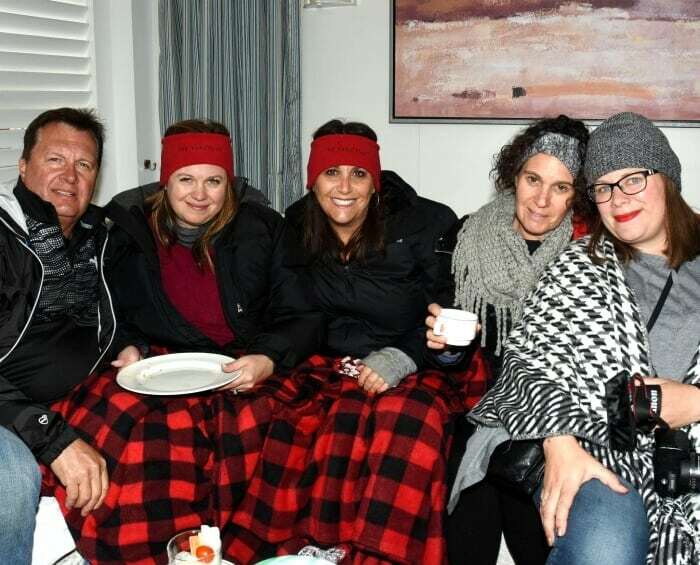 I had one of those on our trip, but not to worry, hubby brought me the most delicious zucchini soup in bed, we watched movies, slept, and I was good as new in the morning. I was also totally inspired to make my own chicken zoodle soup recipe because the soup he brought me was so very very delicious! Serve this soup with our cracker recipe, or maybe some beer bread! And while you’re eating, check out all the places we’ve cruised! I went on another cruise! (You’re not surprised at all, I’m sure). I love cruising so much, so when the opportunity arrived to sail to Alaska with Princess Cruises, I was all over it! Hubby and I cruised with a group of friends from Vancouver to Whittier Alaska, and had an absolute blast. Sadly I had a down day on the trip. Booooo. 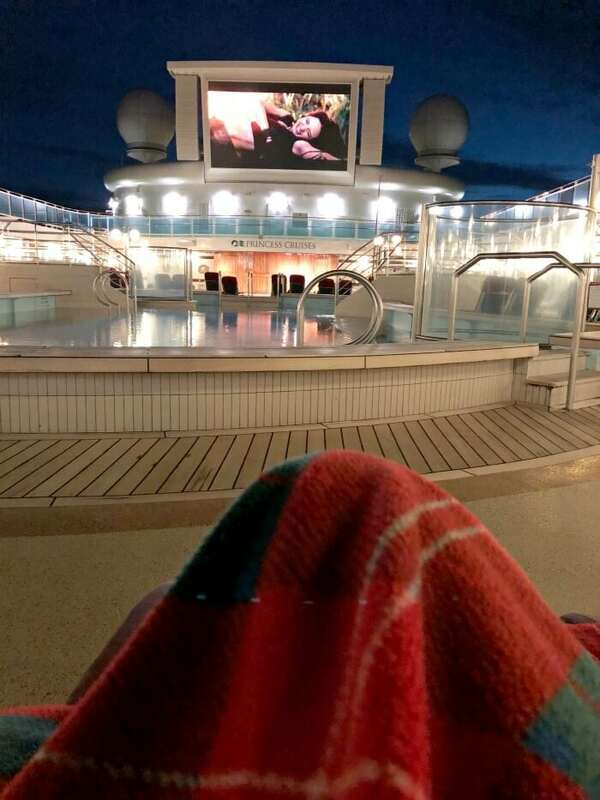 Not sadly, there are still so many things to do on a cruise even when you’re feeling worn out and cranky pants. During the day, I relaxed with Holly and Ken in the Sanctuary, later in the evening Stephanie and I hunkered down on the deck with forty two thousand blankets and watched a movie. Then Wesley brought me delicious zucchini soup in bed, and by morning I was back to myself. Chicken stock – We like to make our own chicken stock. You can easily make it on the stovetop, in the slow cooker or in the instant pot. See how to make chicken stock here. Garlic – We used fresh garlic for our chicken zoodle soup, but the stuff in the jar would work as well. Carrots – Definitely fresh carrots for this recipe. Frozen our canned carrots will turn to mush when cooked in a soup. If you absolutely can’t get fresh carrots, add the canned or frozen (thawed first) at the end when you stir in your chicken. Celery – Again, you’ll want fresh celery for this soup. Onion – We used fresh onion as well. One of the reasons I like fresh vegetables in a soup like this is not only do they create a delicious flavor, but they also provide bulk and texture. Seasoned salt – I love Lawry’s seasoned salt for this recipe. Zucchinis – Definitely, absolutely, 100% you want fresh zucchini for you zucchini noodle soup! Use a julienne peeler or a spiralizer to get “noodles” or just chop into a small dice (that’s how it was in the soup on the cruise). Any which way it is delicious. Chicken – We usually have frozen cooked chicken at the house, but sometimes I’ll use a rotisserie chicken, or even just make some chicken quickly in the instant pot. 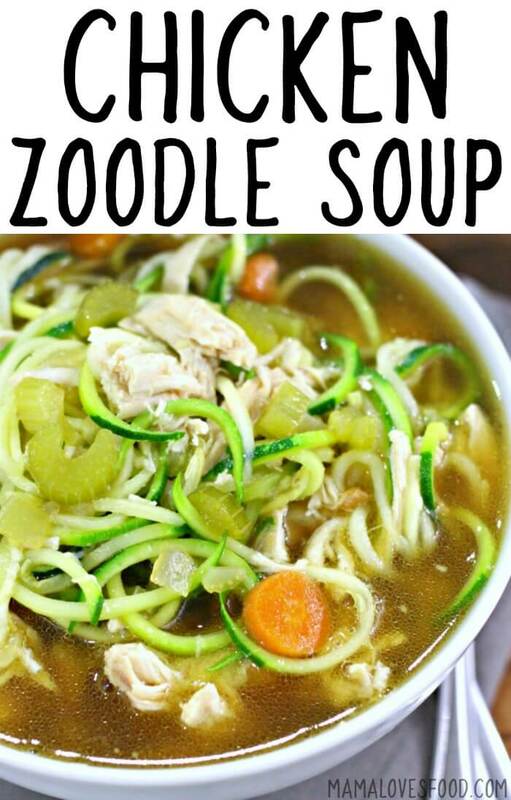 Is chicken zoodle soup healthy? Chicken zoodle soup is very healthy. It’s full of lean meat and vitamin and mineral rich vegetables. 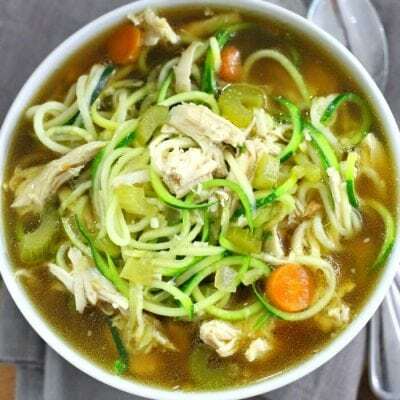 Chicken zoodle soup is made with collagen rich chicken stock and has the benefit of being both healthy and filling. If you’re on weight watchers and use chicken breast, this is a zero point meal. If you make your chicken zoodle soup on the stove top, the main thing you’ll want to make sure is that you’ve simmered everything long enough to really bring out all the flavors. You’ll see the broth becoming a deeper color as it gets close to being done. Don’t be afraid to add a little extra bouillon or salt and pepper if you feel like the chicken stock you started with isn’t as rich as you would like. We always recommend using homemade chicken stock whenever possible, but sometimes it’s not realistic and that’s okay! Adapting this chicken zoodle soup recipe to the instant pot is very easy. You’ll want to cook on manual for five minutes. So simple. But one of my favorite things to do when using the instant pot is to make my own quick stock. To do this, remove the meat from two small cooked chickens, set aside. Put bones and skin from chicken, as well as any vegetable scraps you have around (carrot tops/shavings, onion ends, etc.) into the instant pot. Fill remaining space with filtered water. Cook on manual at least one hour (I like to do as many as three). Strain the liquid and skim the fat. Yum. 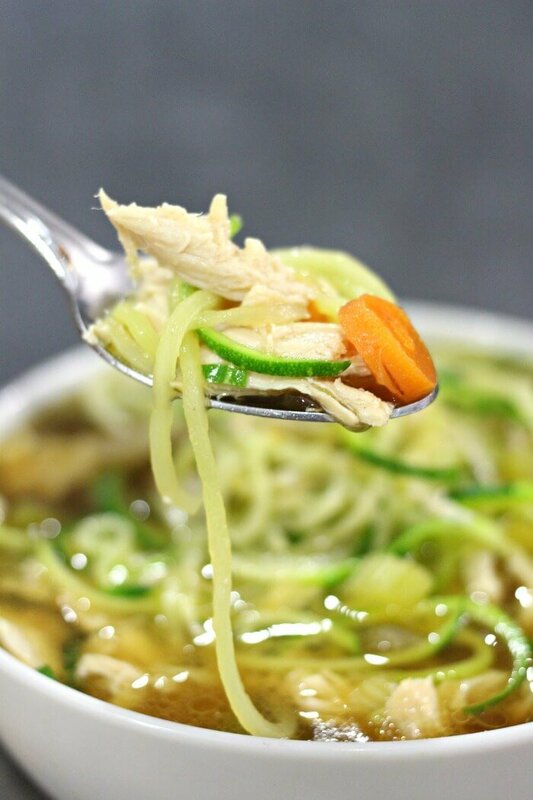 You’ve just made chicken stock for your zucchini noodle soup! The slow cooker instructions for chicken zoodle soup are nearly the same – they just cook longer in the crock pot. You’ll want to cook the vegetables and seasonings in the stock for at least 4 hours on high or 8 hours on low. Then stir in the chicken and zucchini noodles, cover for about five minutes, and serve! Cruising and eating our way through Alaska with Princess Cruises was the trip of a lifetime. I can’t wait for our next adventure and am constantly looking at the cruise itineraries to see where we might sail off to next. If you love exploring the world as much as I do, make sure to check out all our travel posts and cruise inspired articles! Spiralizer – Even if the only thing I ever made with this was zoodles (zucchini noodles), it would be 100% worth the cabinet space. 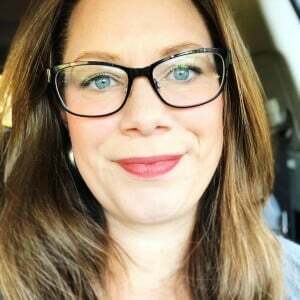 Instant Pot electric pressure cooker – This electric pressure cooker, and my gas grill are the saving graces in our home. A delicious roast with carrots and potatoes in 45 minutes? Yes, please! You’re seriously going to love this one! 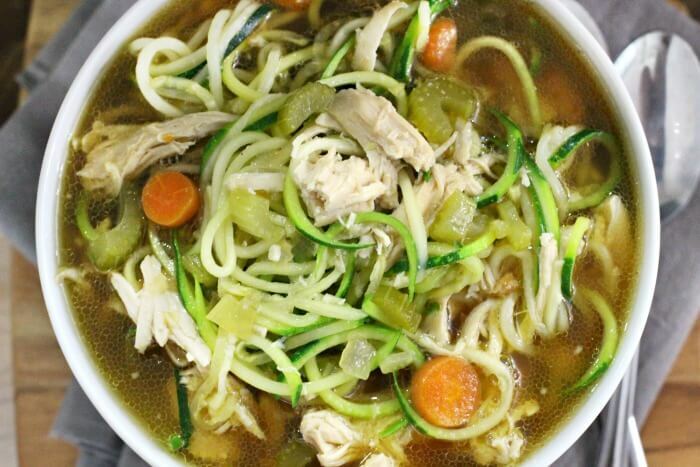 Chicken Zoodle Soup is the guilt free comfort food you didn't know you needed. Easy to make, filling and delicious! Bring everything except chicken in zucchini to a simmer in a lidded pot on the stove. (If using the instant pot manual for 5 minutes, if using a slow cooker high for 4 hours or low for 6 hours). Allow to simmer low with the lid on for at least 15 minutes. Carrots should be very tender. Turn off heat and stir in zucchini noodles and chicken. Cover and allow to steep for about 5 more minutes. If you are using chicken breast, this is zero Freestyle Weight Watchers points. We like to have chopped chicken ready in the freezer all the time, here’s how! If you don’t have any chopped chicken handy, a rotisserie will yield approximately 4 cups of meat. « Skagway Alaska – Everything to do in Skagway Alaska! It sounds like the cruise was amazing and this soup sounds like the perfect way to warm up! Can’t wait to make it when the weather cools off! 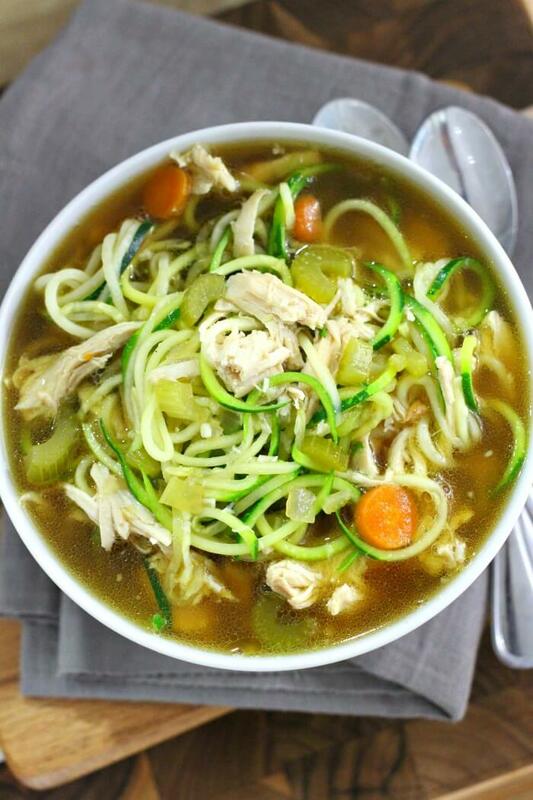 Chicken zoodle soup is one of our all-time favorites! It’s so easy and crazy comforting when you’re feeling under the weather! so good! Oh yum, this is so hearty but good for you and comforting!